Live and on-demand webinars for IT professionals focused on hybrid IT solutions encompassing cloud, colocation, managed services, DRaaS, IT security, and more. You’re Perfect, You’re Doomed. A psychological examination into cybersecurity. TierPoint’s Chief Security Officer, Paul Mazzucco, is an expert in the field of human behavior and cybersecurity, and in this presentation, Mr. Mazzucco examines the natural human tendency to fear the unknown and how this has consequences on today’s IT leaders, namely for the data and people they attempt to protect. Mr. Mazzucco will also highlight how attackers leverage these psychological vulnerabilities for attacks in Phishing, Internet of Things (IoT), and Artificial Intelligence (AI). Attendees will learn about the latest tactics attackers are using to exploit cybersecurity efforts, and they will also understand how to address the tension between the unknown of what an attacker is capable of doing versus what an IT leader can proactively do to avoid organizational complacency and security vulnerabilities. In addition to Paul’s security duties at TierPoint, Paul Mazzucco is a Certified Information Systems Security Professional (CISSP), Microsoft Certified Systems Engineer (MCSE), and Certified Ethical Hacker (CEH) answering to the FBI, the United States Secret Service, Pennsylvania Electronic Crimes Task Force (PAECT) and the United States Computer Emergency Readiness Team (U.S. CERT). • How to get better compliance and data protection by moving data between on-prem and the cloud. As reported in Forbes last year, 73% of companies are planning to move to a fully software-defined data center within two years. A software-defined data center is based on a virtualized environment of compute, storage, networking and security in conjunction with policy-based management and automation. The evolution from a traditional data center architecture to one that is software-defined can take months if not years but can yield immense benefits for the business. Join us for a discussion on the progress toward the fully software-defined data center, including benefits of infrastructure as code and overcoming challenges associated with traditional workflows. As businesses embark on IT transformation initiatives, they must ensure their cloud connectivity is secure, reliable and high performing. Low latency from the data center to the edge is crucial. With the rapid growth in IT deployments leveraging public cloud services as well as legacy systems and hosted private clouds, direct cloud connectivity is a key success factor for hybrid and multi-cloud strategies. 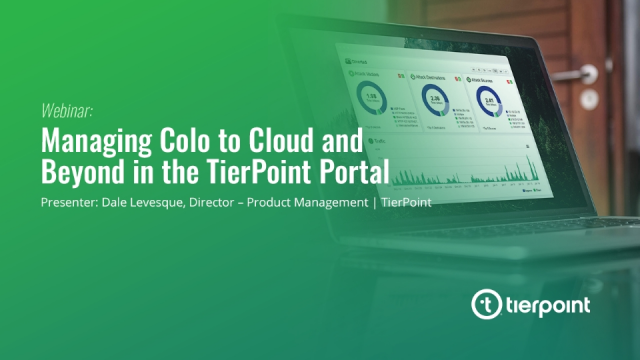 Join TierPoint’s Dominic Romeo and Zayo’s Christopher Smith, for a discussion on cloud connectivity to learn how these solutions can effectively and efficiently bring public cloud capabilities to the edge. TierPoint's Paul Mazzucco will discuss the double-edged sword of artificial intelligence, which is aiding the efforts of hackers and protectors alike. Join us as we explore the world of the Darknet, how bad actors are using machine learning and AI to create better attack vectors, and how IT professionals are also using these tools to defend their vital infrastructure. Powered by behavioral modeling, these technologies are the next frontiers in attack mitigation. Digital transformation doesn’t happen overnight. Whatever your strategy, you’ve likely had to research, assess, trial, or even migrate workloads to a public cloud. Platforms like Microsoft Azure offer an expansive portfolio of solutions but also create many opportunities for quick wins in the traditional IaaS space and, for many, are a step in the journey to transform the legacy enterprise. Join us for a discussion focused on the core set of services needed to build out a virtual private cloud in Azure, addressing many of the decision points that professionals are confronted with during this process. Additionally, we will review several PaaS offerings that might complement your IaaS environment. With the ever-changing cyber threat landscape, you need to be sure the security measures you put in place are performing as expected. There were over 53,000 reported security breaches with 2,216 confirmed data breaches reported in the 2018 Verizon Data Breach Investigation Report. IT executives consider network security a critical priority, but they also want to reduce the complexity associated with supporting an array of disparate security products. - how the right partner can help strengthen your security posture. BraveIT is an interactive, thought leadership event designed for the modern IT professional who is tasked with navigating opportunity and risk in a mission-critical world. The live event is taking place in Chicago on 9/13, we hope you'll join us for the live stream if you are unable to attend in person. In this era of accelerating opportunity and risk, IT decision-making evolves constantly. And while the propagation of possibilities fuels innovation and growth, it also makes it increasingly difficult to keep pace; to continuously optimize mission-critical strategies in the face of new threats and persistent change. Although your master plan may be established and stable, you know it can’t be static. Fine tuning it regularly is a required exercise in business optimization, product differentiation, and risk mitigation. That’s why BraveIT is an essential part of your yearly planning cycle. It keeps you current with industry best practices and best-in-class implementations, pressure tests your operating assumptions and enriches your plans for a broad range of potential events and opportunities—all while connecting you with peers and partners who are facing similar challenges. Visit https://web.tierpoint.com/braveit/2018-agenda for full details.